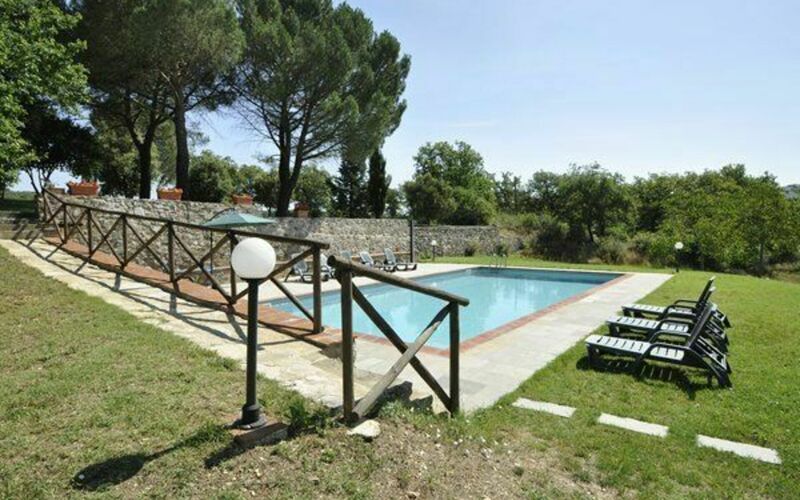 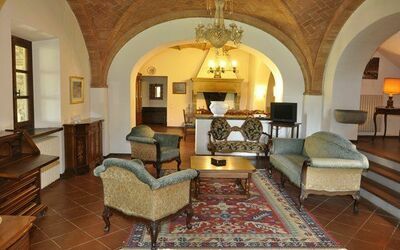 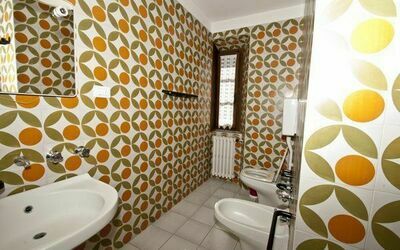 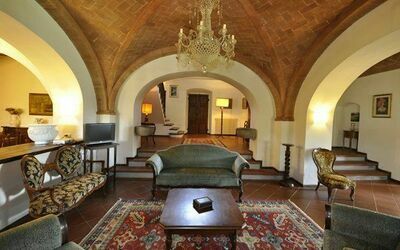 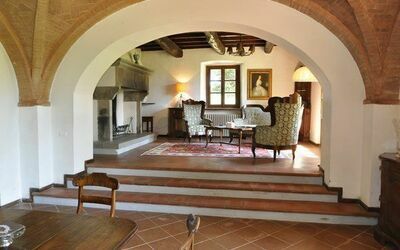 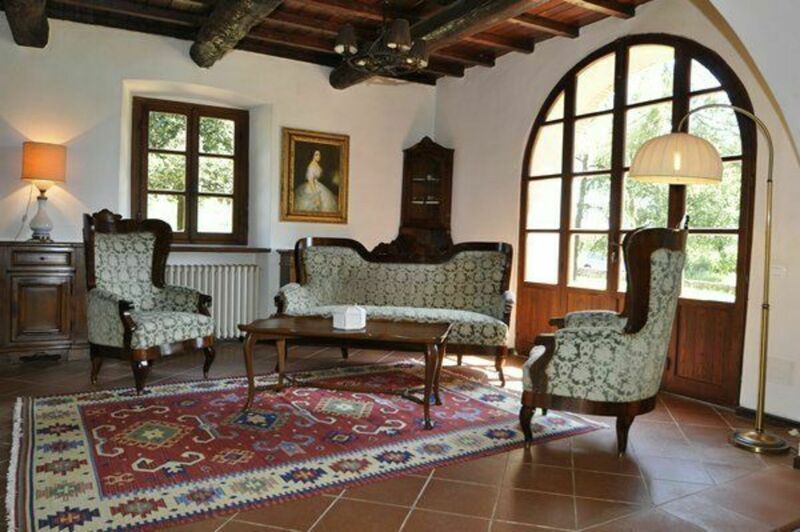 Casavecchia is enchanting with its typical Tuscan architecture, stone walls, large windows and French doors, wide terraces surrounding the house and an amazing green park with a private fenced lake. 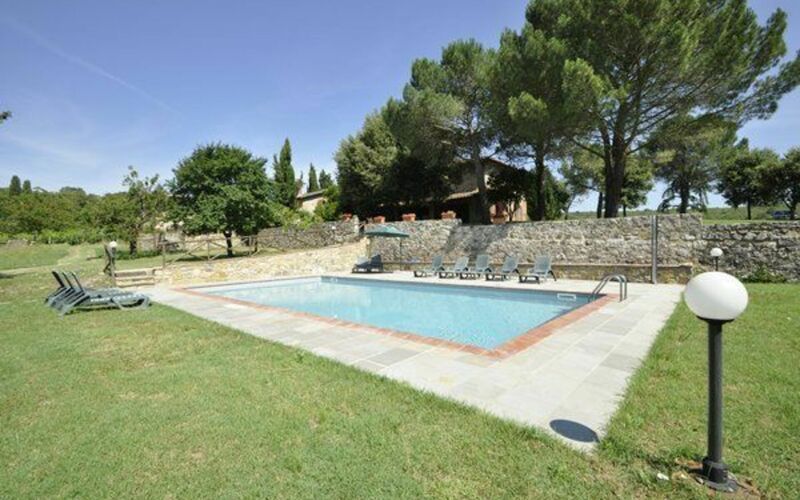 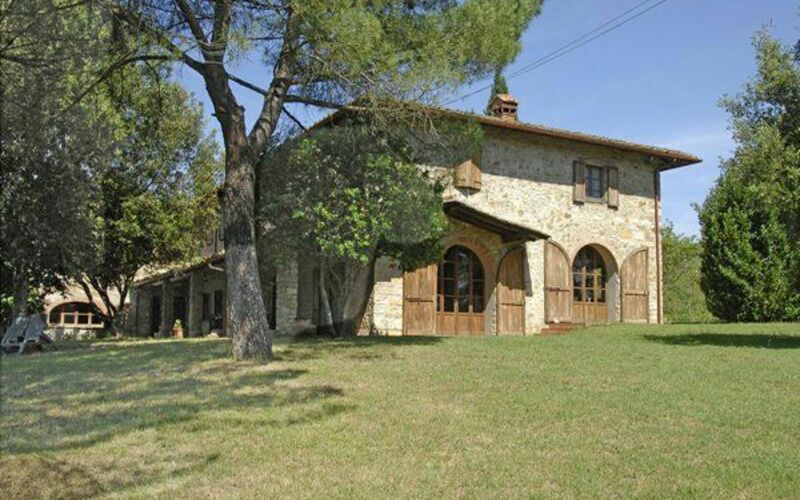 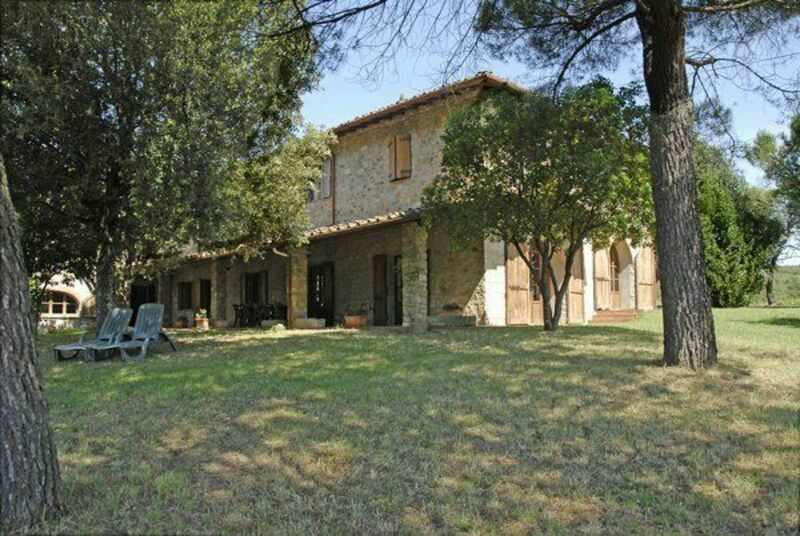 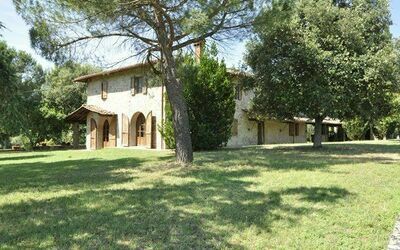 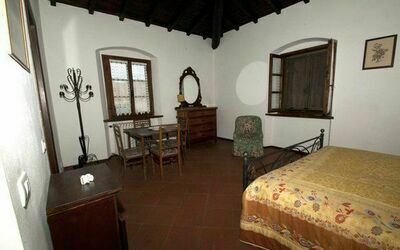 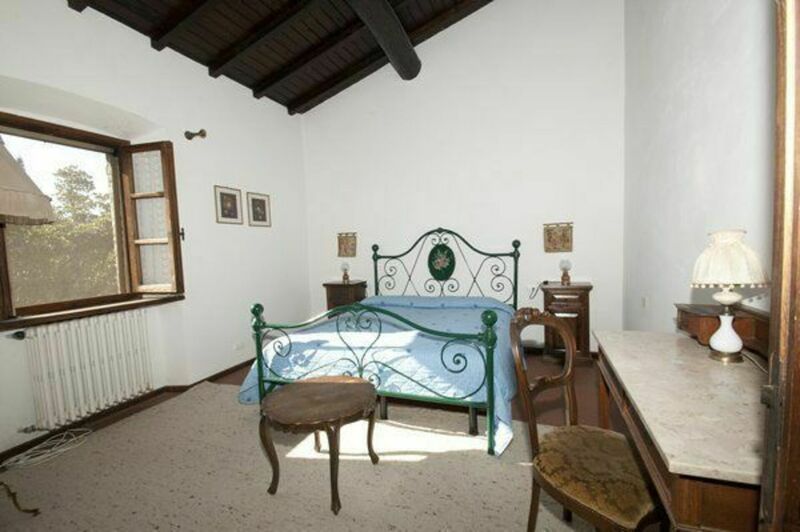 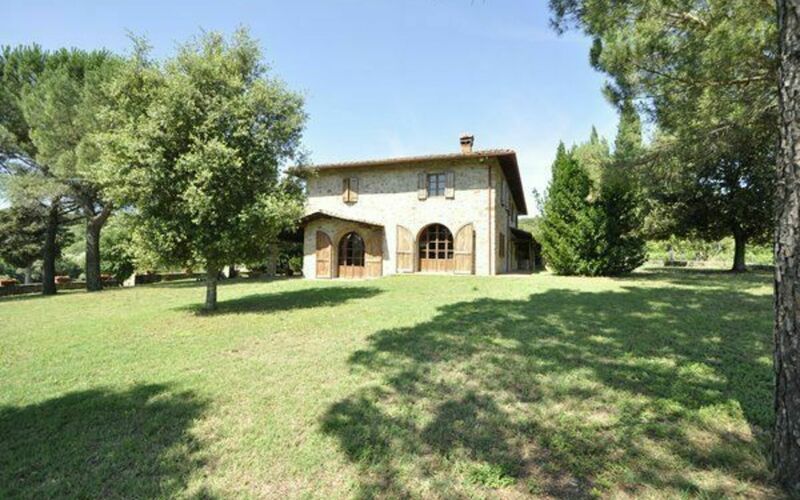 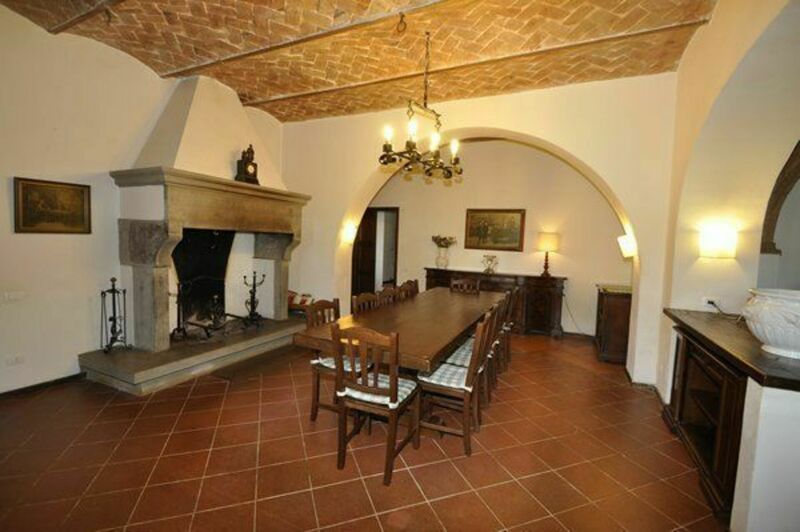 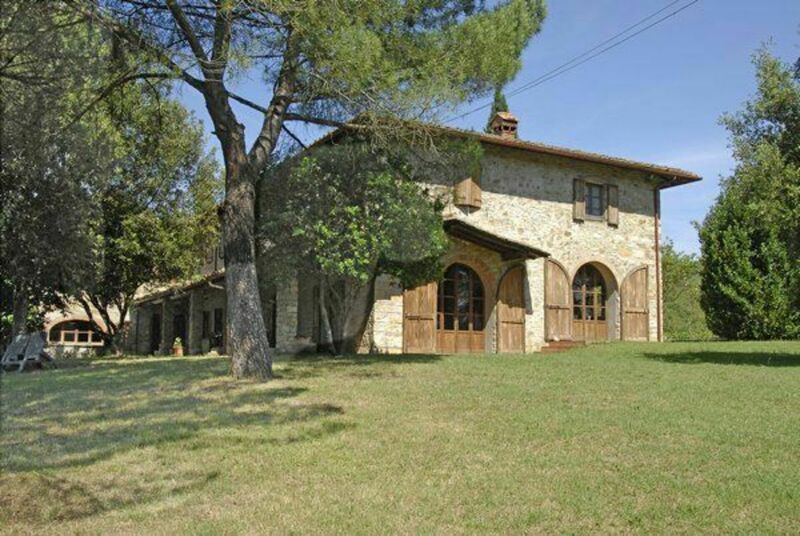 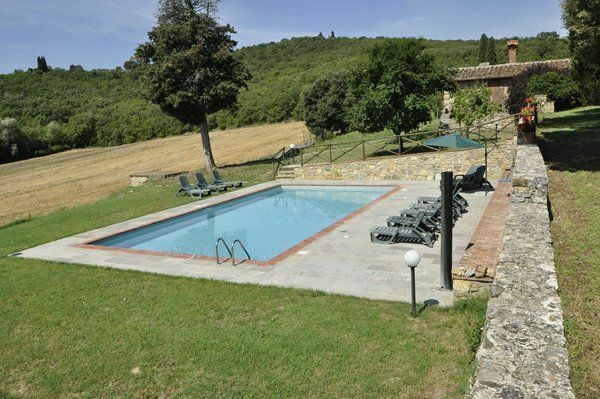 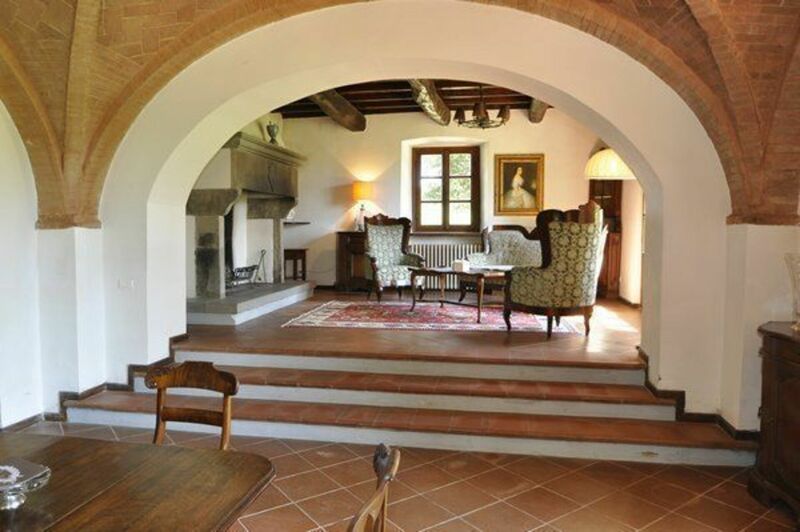 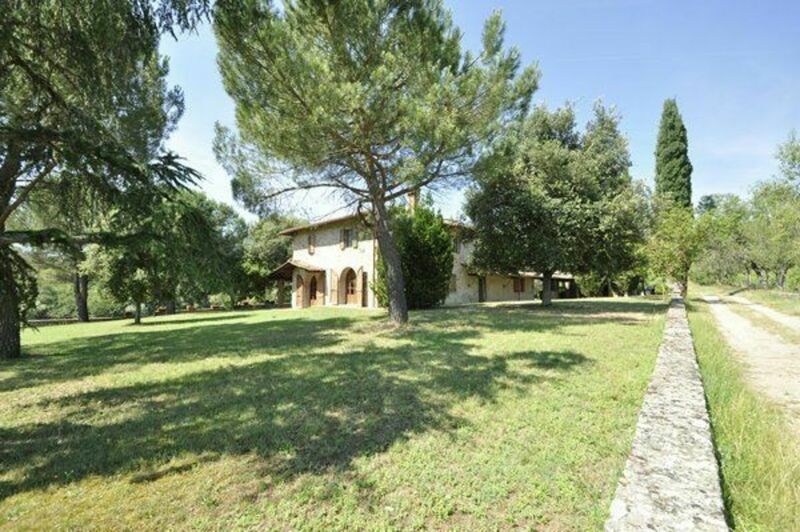 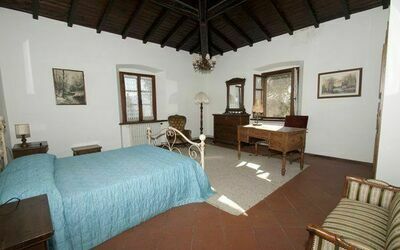 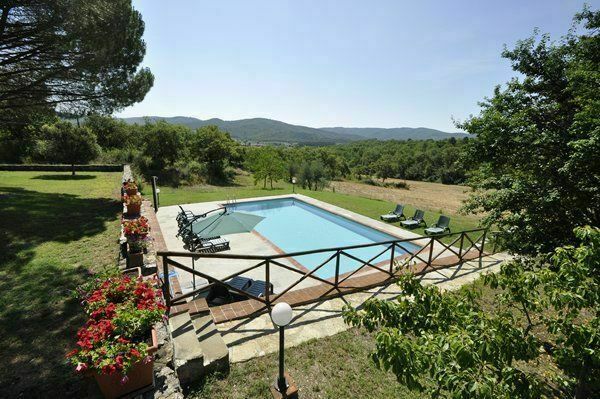 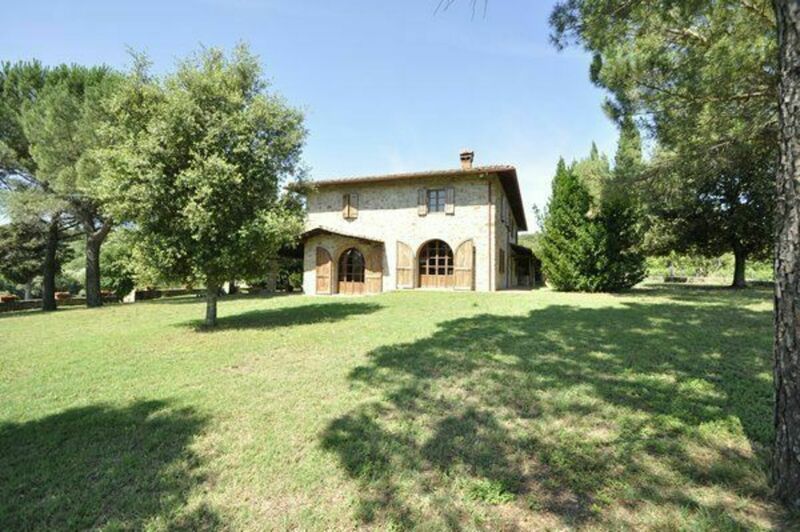 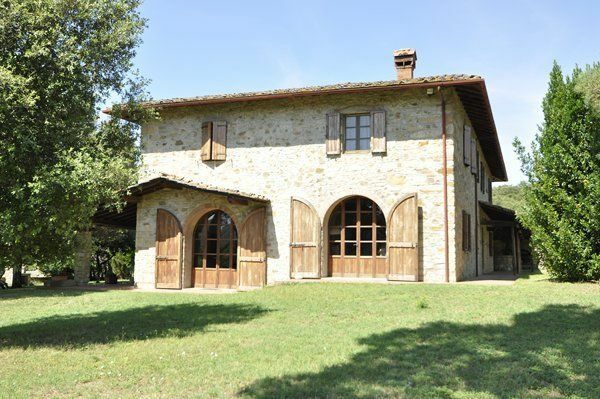 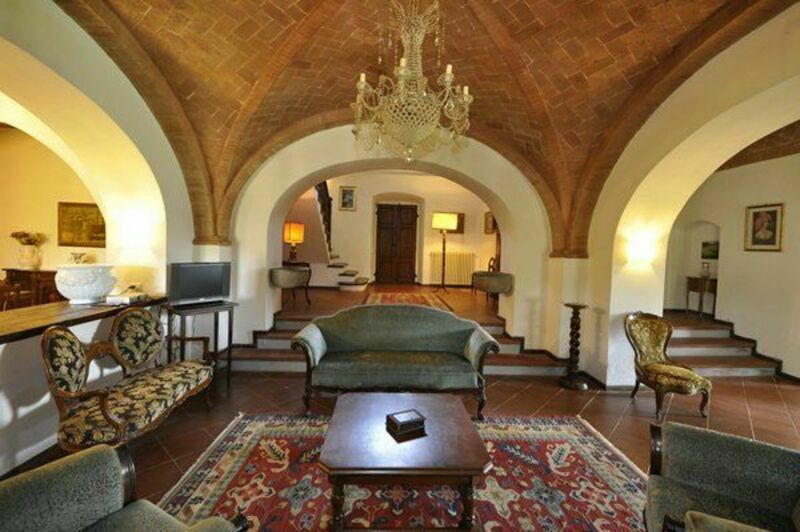 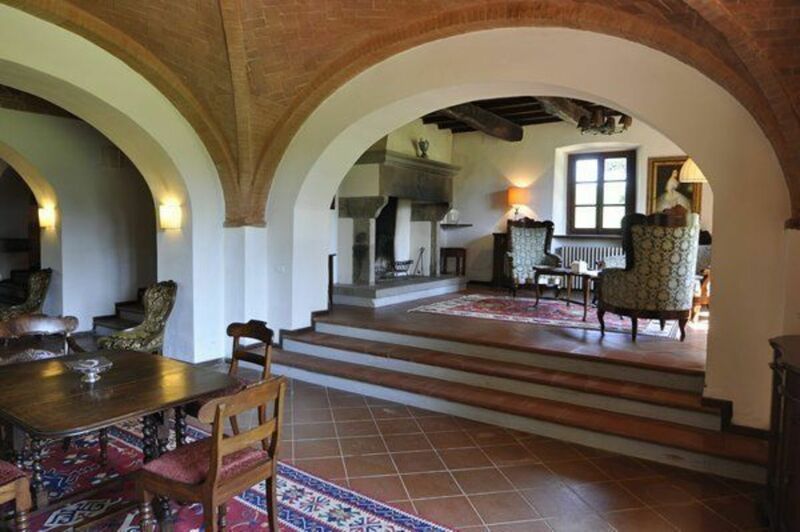 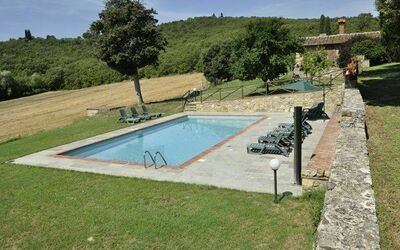 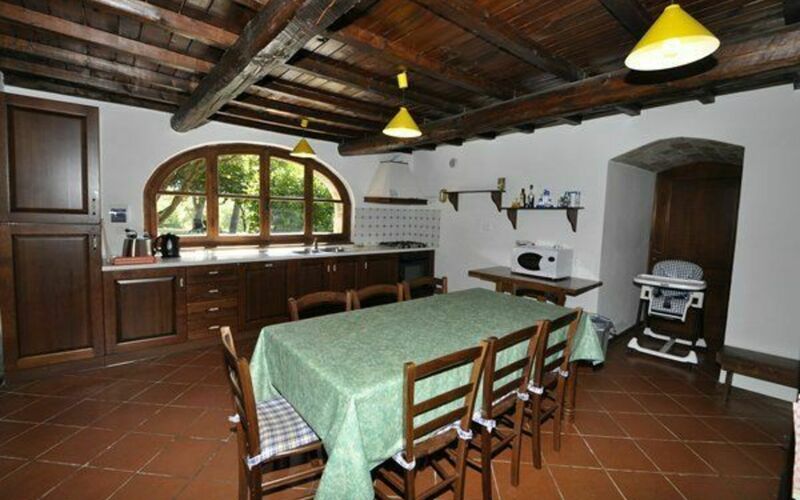 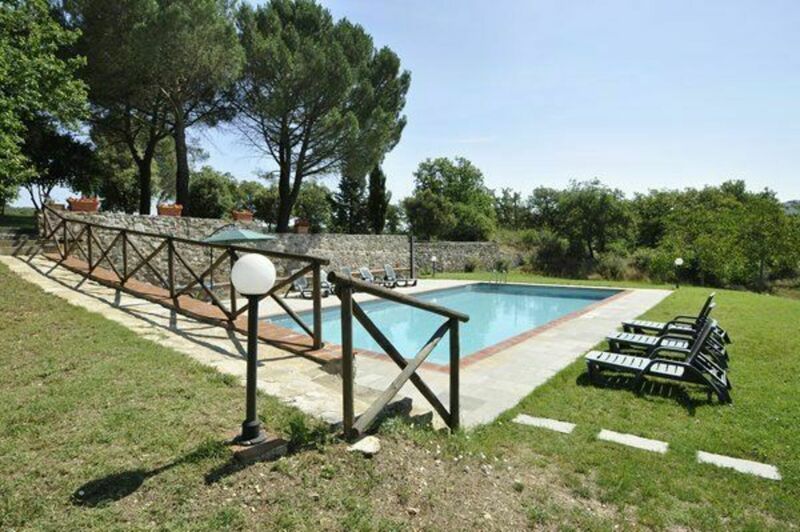 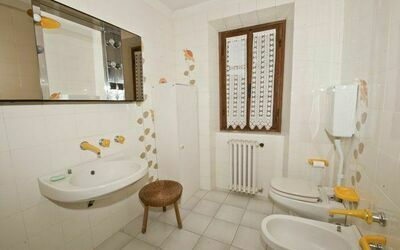 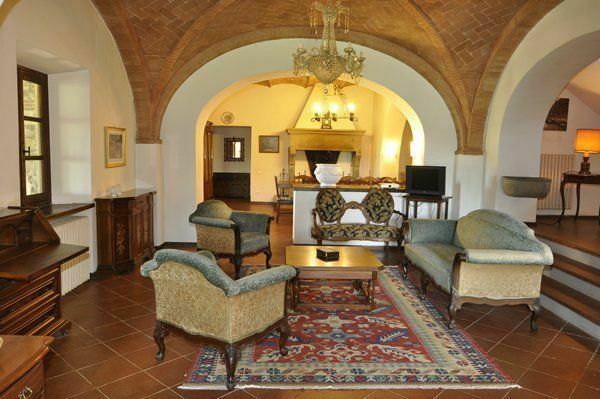 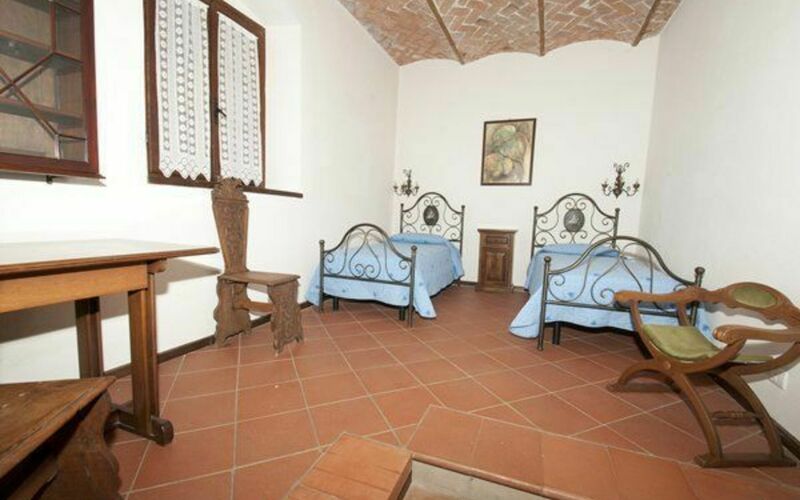 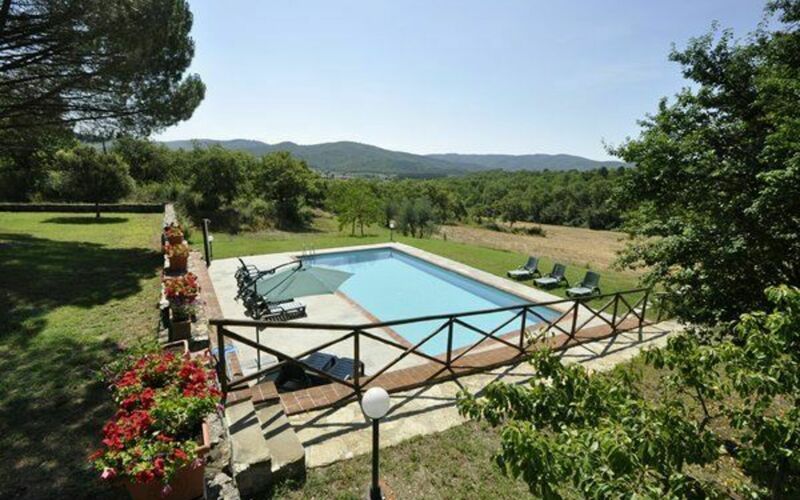 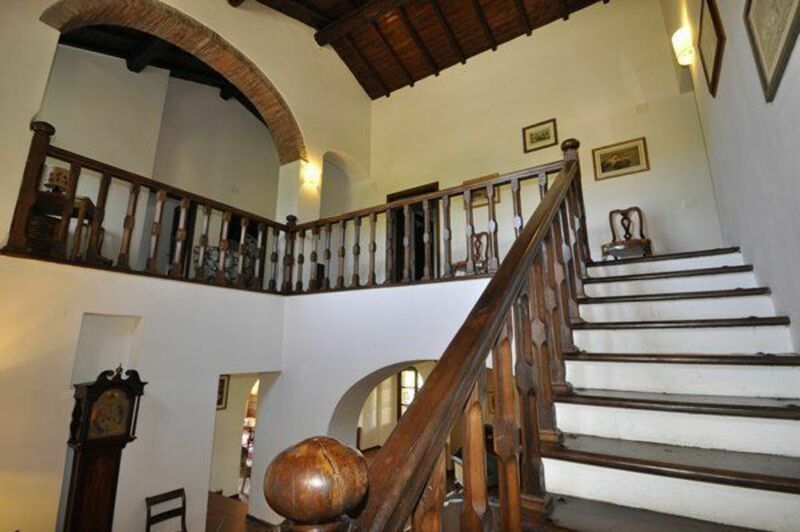 A charming Tuscan villa offering 5 bedrooms and 5 baths located in a peaceful countryside. 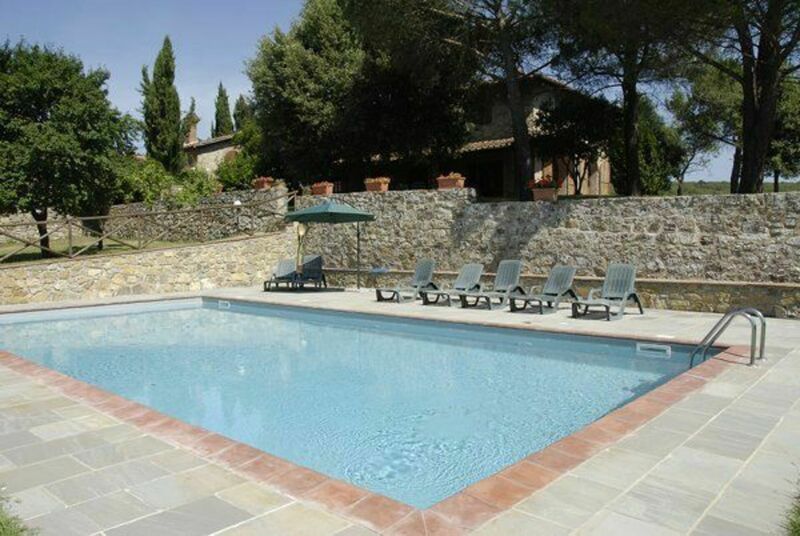 A private swimming pool is located 20 meters from the house and equipped with deck-chairs, sun beds, umbrellas and anything you need for a relaxing vacation. 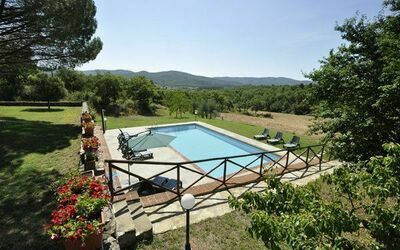 The villa is located in a lush property with a green garden all around it, and a private lake 300 meters distant from the house. The lake is fenced in and absolute safe, it can be used for swimming or fishing if you want or just to admire the beautiful landscape. 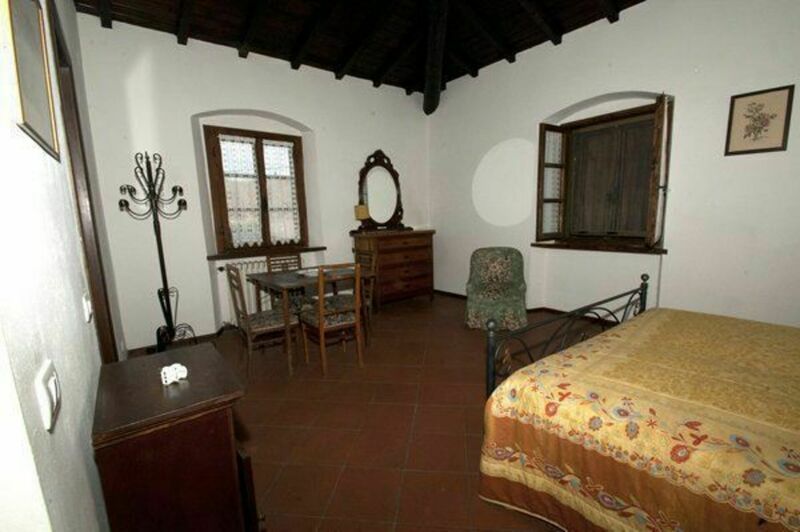 The lady who looks after the house lives on-site next door in an annex, totally unintrusive. 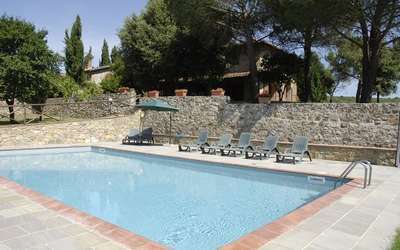 At guests' disposal: The villa has a private swimming pool (6x12 mts 1.50 mts depth ) where to spend moments of total relax or sport, if you prefer. 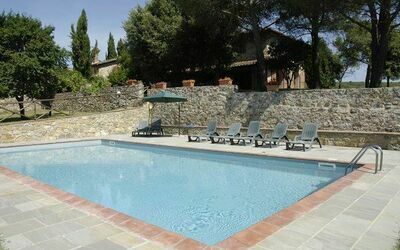 The pool is equipped with umbrellas, sun beds and deckchairs. 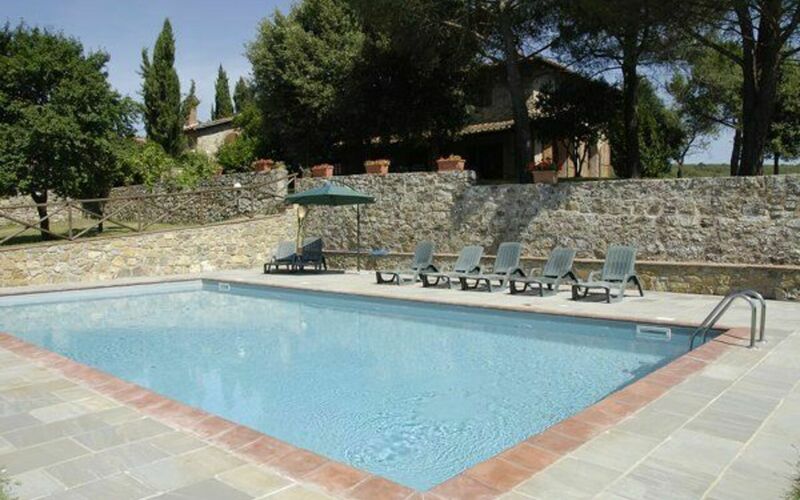 The outdoor area between the pool and the villa is equipped with tables and chairs for outdoor meals, and the 20 m long terrace next to the house offer a nice covered area where to stay during the day. Motor vehicle access to the house: 1 km via unpaved road not suitable for sport car. 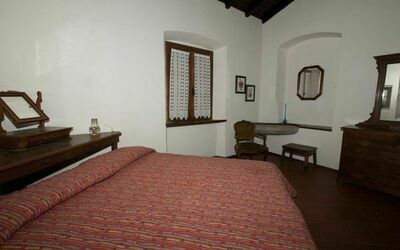 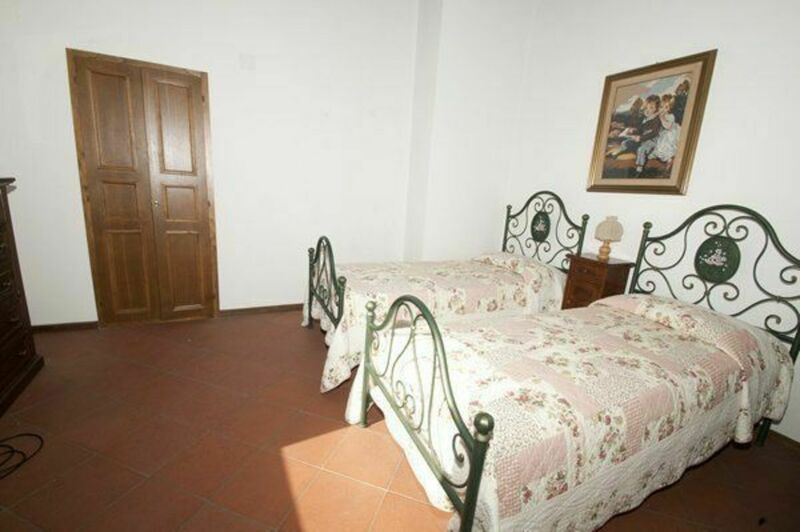 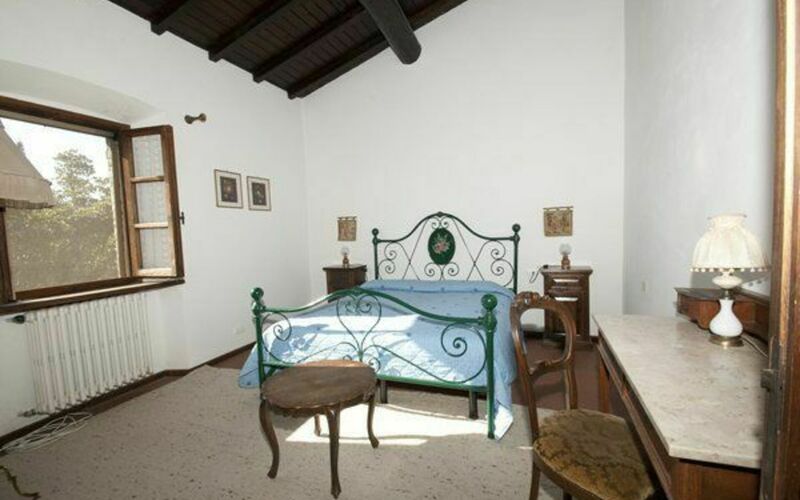 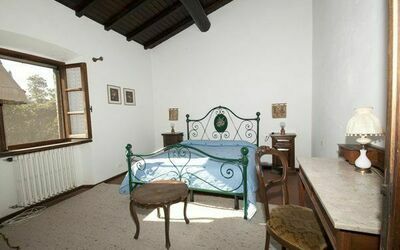 This cosy villa is really secluded and charming, offering much peace for a relaxing vacation. 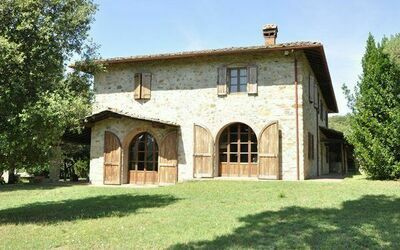 The villa is composed of two floors, an original architecture of a typical Tuscan countryside, with thick stone walls that keep a cool environment inside even in hot summers days. 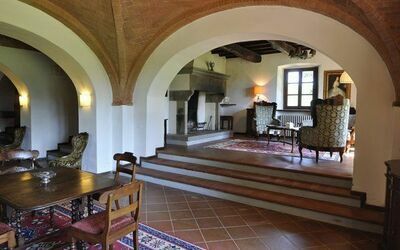 The ground floor is composed of a large living area, with three different living rooms, two of them with open fireplace and a large and comfortable dining room with place for everyone to seat together. 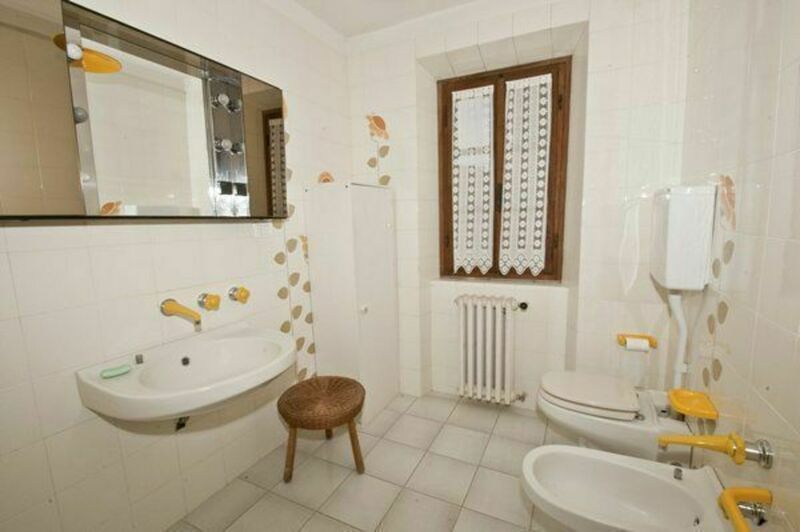 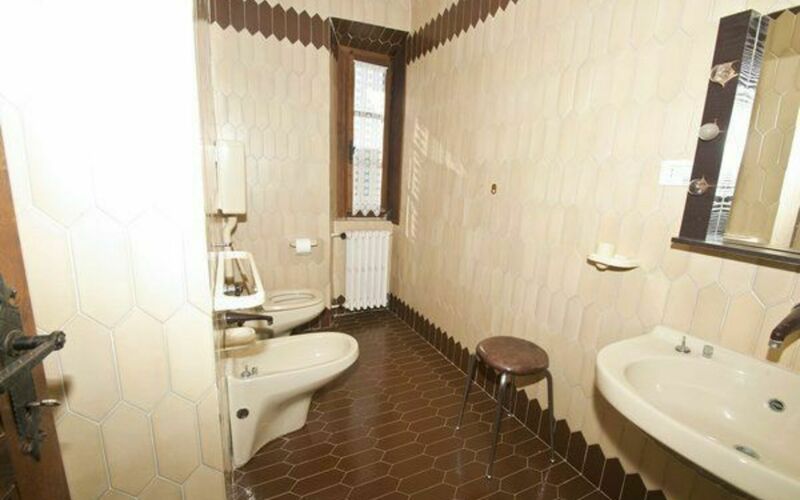 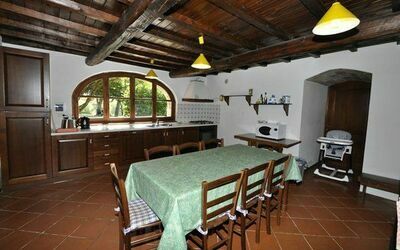 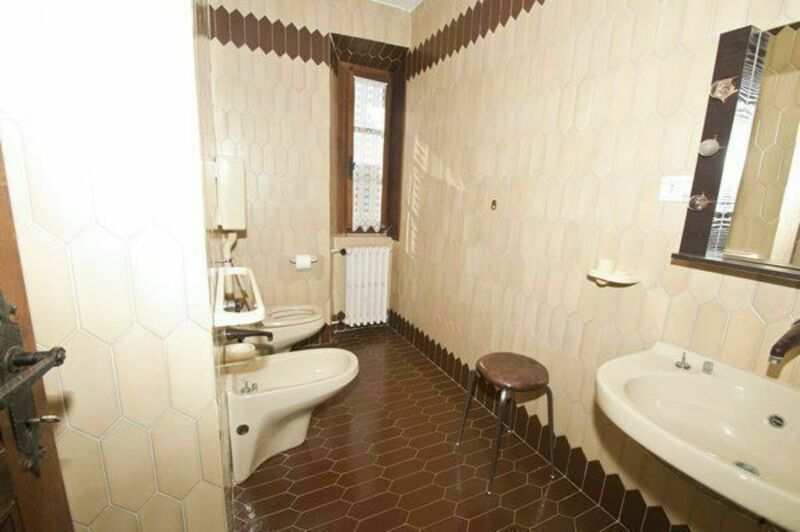 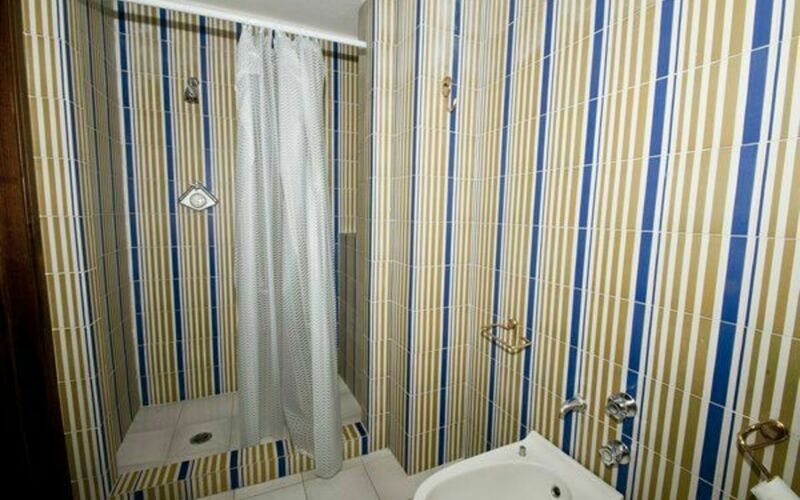 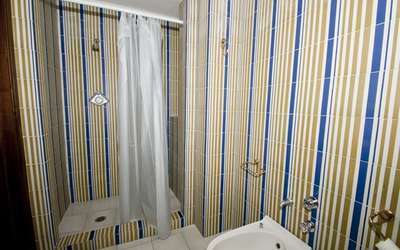 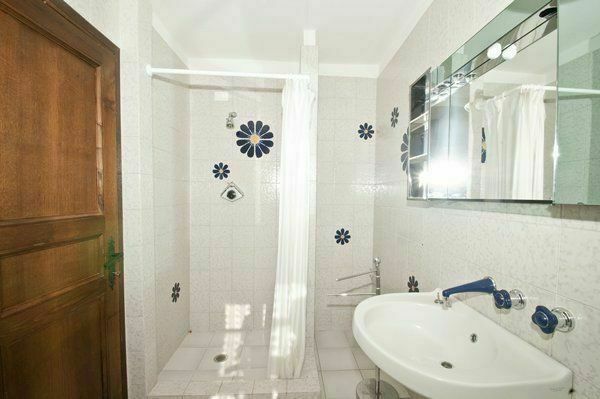 The kitchen has been completely renovated autumn 2007 and offers now all modern comforts and a lot of space. 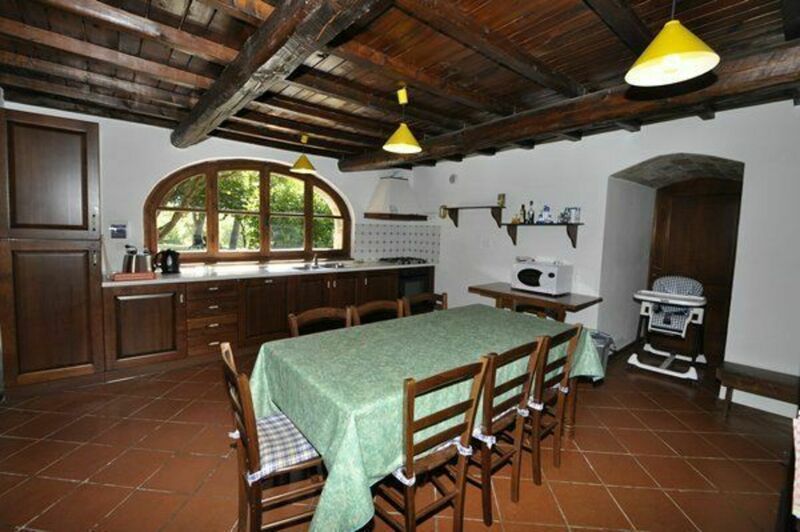 The kitchen has a direct access door to the garden and the covered terrace for outdoor eating. 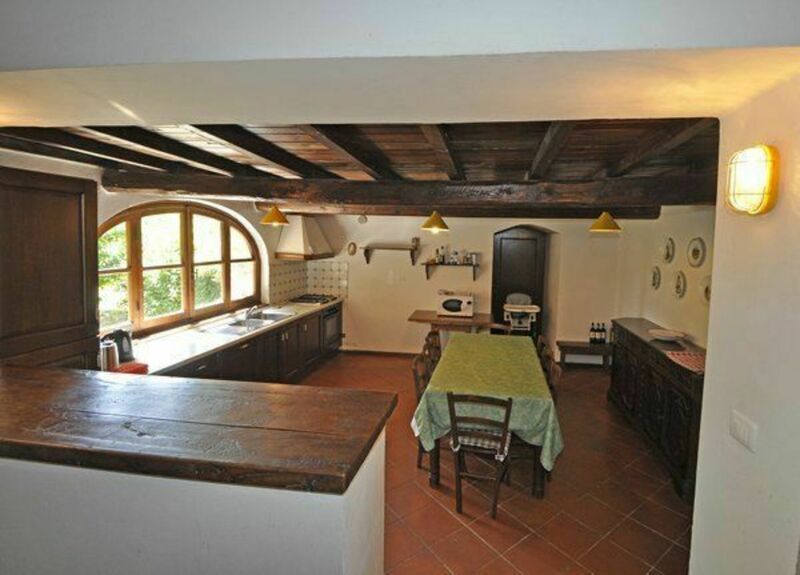 In the kitchen you will find a large 6 burner stove with oven and grill. 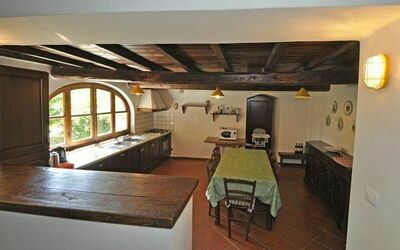 There are 2 super sized refrigerators, one in the kitchen and the other in the attached storage room . You have a dishwasher, clothe washer, microwave, toaster and an American coffee maker. 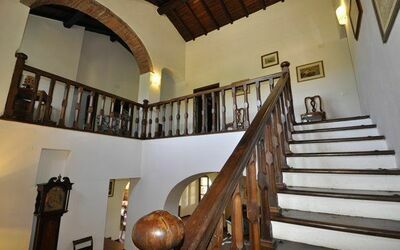 All silverware, plates, glasses, pans and pots to cook, are of excellent quality. 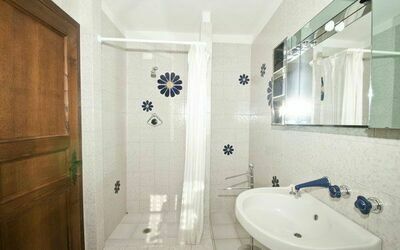 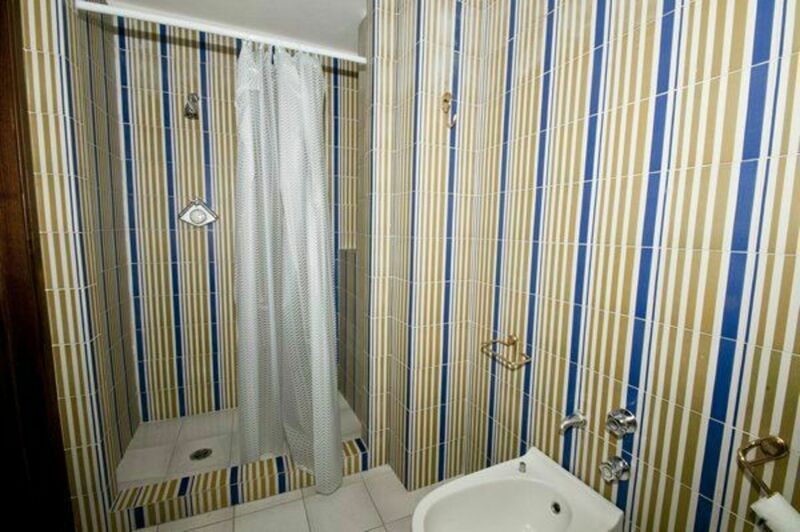 On first floor there are 4 double bedrooms with en suite bathrooms (with bathtub and shower) and 1 twin bedroom with en-suite bathroom.